"Our nation needs your nations to do more," said the vice president, carrying a message from President Donald Trump. Vice President Mike Pence, serving as an ambassador for President Donald Trump's hard-line immigration stance, told the leaders of three Central American countries Thursday night that they must respect America's borders and stop their citizens from coming to the U.S.
"This exodus must end," Pence said to the presidents of Guatemala, El Salvador and Honduras after meeting with them in Guatemala City. "Just as we respect your borders and your sovereignty, we insist that you respect ours." "Our nation needs your nations to do more," the vice president added. With a blunt message, Pence, who was joined on his trip by Homeland Security Secretary Kirstjen Nielsen, listed all the methods the Trump administration was employing to stop illegal immigration, and directed the foreign leaders to tell "your people that coming to the United States illegally will only result in a hard journey and a harder life." Specifically, he asked the three presidents — Jimmy Morales of Guatemala, Sanchez Ceren of El Salvador and Juan Orlando Hernandez, of Honduras — to "take down public advertisements for human traffickers," "renew the fight against corruption, criminal groups, and gang violence," and to "strengthen" their own borders. The three countries, known as the Northern Triangle, have seen intensifying economic struggles and gang violence, which have led hundreds of thousands of their citizens to flee to the U.S. in search of a better life. More than 150,000 Guatemalans, Hondurans and Salvadorans have left their homes and journeyed to the southern border of the U.S., seeking to enter the country illegally, in 2018 alone, according to The Associated Press. Pence also addressed the citizens of the three nations in the televised speech, giving them his own set of instructions. "If you want to come to the United States, come legally, or don't come at all," he said. "If someone tells you they can bring you or your children to America outside the law, don’t believe them." "Don’t risk your lives or the lives of your children by trying to come to the United States on the road run by drug smugglers and human traffickers," Pence added. "Hold on to your homes and hold on to your children. Build your lives in your homes." Former Vice President Joe Biden recently wrote an op-ed about the Obama administration's efforts to curtail migration from those countries and the difficulties of doing so. Pence's visit comes as the Trump administration has taken drastic steps in recent weeks to curb the flow of illegal immigration from Central America, including the implementation of a "zero tolerance" policy of charging everyone who attempts to cross the U.S.-Mexico border illegally. That policy, however, led to thousands of migrant children, some under a year old, being separated from their parents or legal guardians at the border and housed in detention centers. Trump signed an executive order this month reversing the policy, allowing families to be detained together instead. But it didn't stop the detention of children. 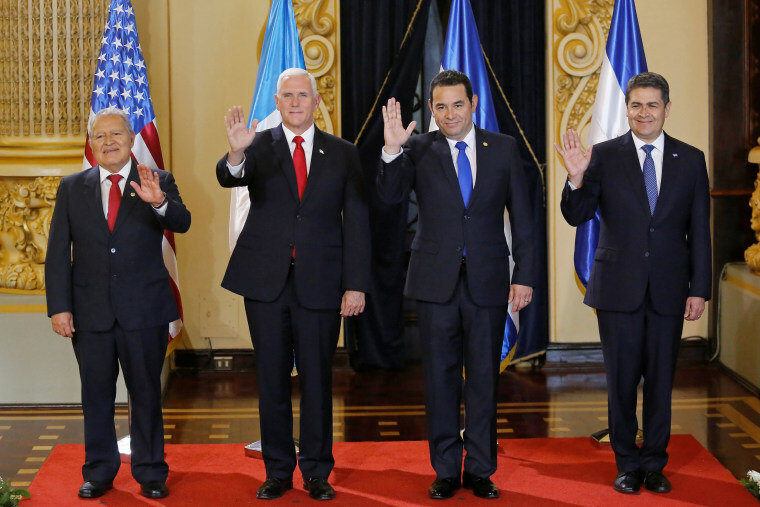 Responding to Pence, the presidents of El Salvador and Honduras said they were pleased that Trump had signed the order to end the separation of parents and children but wanted to see the prompt reunification of the families. "I want to reiterate my governments resolve to overcome the issue with the separated families at the border. (We’re) working with U.S. authorities for a quick solution," said Ceren, of El Salvador. "It is vital for their psychological health to reunite them with heir parents." Hernandez, of Honduras, said Trump’s order was a "great step,” but added, “we also want protocols to resolve the issue of reunifying families."